This little guy is one of two cats (brothers) that are currently in our care. We also have another older female cat called Willow seen in my 1st posting on Treklens. shown here on his left front paw. in a breeding program for any breed. and the Master Creator Himself. Yes, cats sure know how to make a comfortable hiding place, but I love this one. 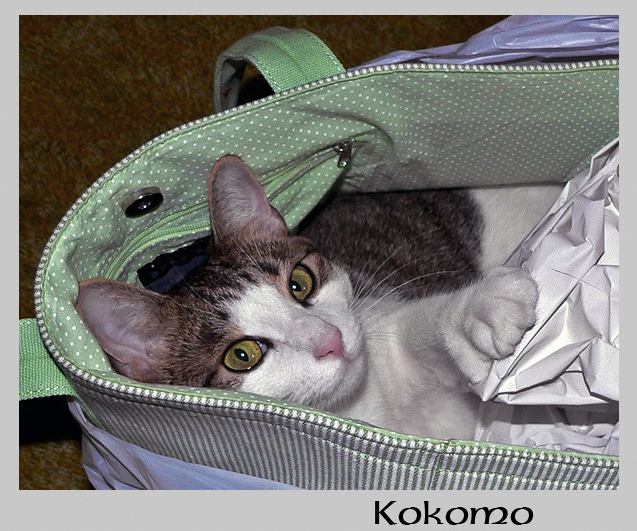 It is perfect for the picture as is Kokomo, the light his eyes are catching makes the picture a joy to see. What a cute face on Kokomo and a great shot of him enjoying his 'snug in a bug' hidey place. I once had a cat called Cocomo also.